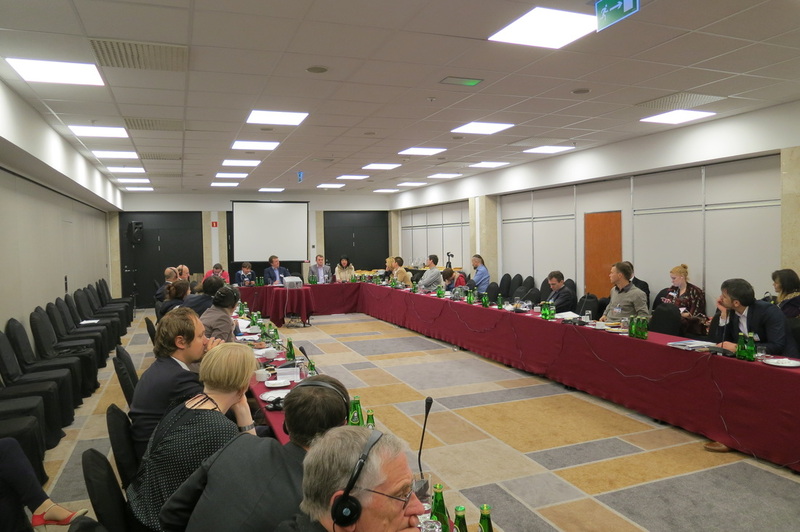 On 24 September 2014, IPHR organized a briefing dedicated to problems of impunity in Ukraine. 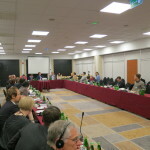 The event, which was organized as part of an IPHR project implemented in the framework of the Civic Solidarity Platform (CSP), took place in Warsaw, Poland, parallel to the OSCE’s annual Human Dimension Implementation Meeting (HDIM). The panel at the meeting, which was moderated by CSP web-editor Andrei Aliaksandrau, included the following speakers: Volodymyr Yavorskyy (Ukrainian human rights lawyer), Andrey Yurov (Crimean Field Mission on Human Rights), Olena Rybak (Civic activist, widow of an assassinated member of the Horlovka City Council) and Andrey Schekun (the Crimean Center for Business and Cultural Cooperation, torture survivor in Crimea). The discussion centred on the Maidan events, Crimea and the conflict in the south-east of Ukraine. Volodymyr Yavorskyy commented on the lack of a proper investigation into abuses perpetrated during the Maidan events. He explained that the Ukrainian authorities have decided to open multiple criminal cases that are not interlinked, instead of launching one large criminal investigation that would look at the scale of crimes committed, analyse command structure and identify alleged perpetrators at all levels. This approach hampers the effectiveness of the investigation. On 17 April 2014, the Ukrainian government lodged a declaration under Article 12(3) of the Rome Statute accepting the jurisdiction of the International Criminal Court (ICC) over alleged crimes committed on its territory from 21 November 2013 to 22 February 2014. When a state makes a declaration pursuant to Article 12(3) of the Rome Statute, the Office of the Prosecutor of the ICC, as a matter of policy, opens a preliminary examination into the situation at hand. Accordingly, the ICC Prosecutor Fatou Bensouda has decided to open a preliminary examination into the situation in Ukraine in order to establish whether the Rome Statute criteria for opening an investigation are met. Specifically, under Article 53(1) of the Rome Statute, the Prosecutor shall consider issues of jurisdiction, admissibility and the interests of justice. The lodging of a declaration to the ICC was perceived as a positive step by Ukrainian civil society organizations. Nonetheless, the declaration leaves events before and after the period 21 November 2013-22 February 2014 outside the jurisdiction of the ICC. Taking into account the gravity of the crimes that are being committed in south-east Ukraine, civil society organizations are calling on the Ukrainian government to lodge a new declaration to the ICC extending its jurisdiction to the entire territory of Ukraine without temporal limitations. Andrey Yurov spoke about grave human rights violations committed in Crimea since February 2014. His observations were based on the findings of the Crimean Field Mission for Human Rights, which commenced its work on 5 March 2014 with the aim of providing impartial information about developments in Crimea, as well as offering all-encompassing assistance to initiatives aimed at protecting the human rights of all those affected by the recent developments there. He spoke about the lack of investigations into serious human rights abuses. Nobody has been brought to justice for the murders of Reshat Ametov (whose body was found on 15 March), Stanyslav Karachevsky (murdered on 6 April) and Mark Ivaniuk (murdered on 20 April), all committed on the territory of Crimea. The failure to act of those responsible for prosecution and the lack of interest by Crimean authorities to investigate the murders create a threat of impunity and failure to comply with positive obligations to protect the right to life, Yurov noted. Olena Rybak and Andrey Schekun gave personal accounts of their tragic experiences in a rebel-controlled part of Ukraine and in Crimea, respectively. Next articleStop blocking websites in Tajikistan!